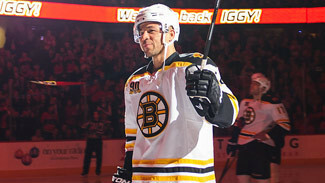 CALGARY -- The Calgary Flames gave a warm welcome to former franchise face Jarome Iginla. The Boston Bruins weren't nearly as nice to the Flames. In his first game in Calgary since leaving in a trade last March, Iginla -- who played 16 seasons with the Flames and served as captain for nine of them -- returned Tuesday night to a touching video tribute and several standing ovations from a sellout crowd of 19,289 fans before the puck dropped on the game. "It was definitely emotional," Iginla said. "I really appreciated the fans. It was a cool feeling and it felt special and the ovation there at the start and then you kind of feel funny out there standing by yourself. Thinking back, I was saying just a bit ago, you think back just trying to make the NHL and then you kind of reflect on all the years being able to play for a great organization here in Calgary and all the fun I've had so far in my career. I feel very fortunate and blessed." He received another standing ovation after being named the game's Third Star. With the entire Bruins team remaining on the bench, Iginla took several spins around the ice to salute the crowd one final time. "The guys were great," Iginla said. "[Zdeno Chara] and all the guys came out and wouldn't let me off the ice. I went for one little loop and they were like, 'no, no, you've got to go one more' and then they made me go one more, too. It was fun and it was nice of the fans. They probably wanted me off the ice by then too." The only thing Iginla, the all-time Flames leader in games played (1,219), goals (525) and points (1,095), didn't do in his return was find the back of the net. Those came from David Krejci and Reilly Smith, who scored in a 98-second span in the third period to give the Bruins a 2-1 win. Tuukka Rask made 26 saves to give the Bruins two wins in as many games on a four-game trip and cap Iginla's return to Calgary. After being outshot 22-9 and trailing 1-0 through 40 minutes, the Bruins flipped the switch in the third. With former Bruins first rounder Joe Colborne in the penalty box for delay of game, Krejci deflected Torey Krug's point shot behind Reto Berra at 13:49 to tie the game 1-1. The goal came moments after Iginla hit the post. With 4:33 remaining in regulation, Smith beat Berra again, streaking down the wing before lifting a shot over the glove of the Flames' goaltender to put the Bruins ahead to stay. "As a team, all the way around, in the third period we came out and guys, each line, we got a lot better and it was fun," Iginla said. "We were just pushing for that tying goal and we were able to get it there on the power play and then to see [Smith] go on a nice move. It was fun. Third period comebacks are always fun and especially in an already memorable game for myself. It was a nice ending." Iginla had a chance at the empty net with Berra on the bench for the extra skater but had his shot blocked by Kris Russell. "The guys, [Krejci] and [Milan Lucic] said they were going to look for me and it came over and they were yelling 'Shoot! Shoot!' and it was spinning and I was a little anxious," Iginla said. "I was hoping to get one there at that point but really, it didn't matter. Just to win, just to have it end well for us, it was cool. At that point, you're trying to fire it and hope but oh well." Inspired by the presence of their former captain -- whose nine-year tenure with the "C" is the longest in franchise history -- the Flames came out firing. After Iginla failed to open the scoring on a chance in close on Berra near the midway mark of the period, Calgary went to work. With Matt Bartkowski off for holding, the Flames fired away at Rask. He made a quick leg save off current captain Mark Giordano, who slid down from the point and buried a one-timer into the left pad 10 seconds into the man advantage. Twenty-seven seconds later, Stempniak took a pass from Hudler and slid a shot that trickled under the Bruins' goaltender and went wide. Mikael Backlund and David Jones fared no better after Rask flashed his left pad on successive saves to complete the penalty kill. Iginla had a final opportunity to put the Bruins up heading into the intermission but his slap shot with nine seconds remaining was turned aside by Berra. "It was obviously very nice to honor Jarome before and there is no one more deserving, but we talked all day about how that was going to be and to be ready when the puck drops," Stempniak said. Hudler finally got the Flames on the board 5:17 into the second period. Streaking down the wing against Boston defenseman Dennis Seidenberg, Hudler ripped a shot from the faceoff dot that dipped under Rask's glove. Rask kept the Flames at bay afterwards despite being outshot 11-4 in the period. He was quick to flash the pad when the puck bounced to Mike Cammalleri in the high slot near the midway mark of the period before getting some help from the goal post after Cammalleri uncorked a shot from the slot after Lee Stempniak's setup. Rask's play proved pivotal after the Bruins mounted a third period comeback in handing the Flames their 15th loss of the season. "That's frustrating," Colborne said. "We came out and I don't know if you could say we totally outplayed them, but we definitely thought we were carrying the play quite a bit. That's a tough loss for us and we're going to have to figure out why. We know that they have some pretty big superstars over there but we didn't really care for the first 40 minutes. Then I think we just sat back and let them kind of take it to us in the third period."